Independent game developer Sumo Digital has brought us some really fun games through the years usually based on existing IPs. 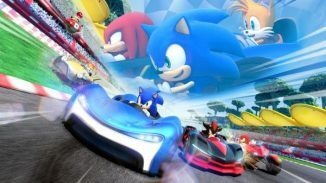 Games like LittleBigPlanet 3, Sonic & All-Stars Racing Transformed, and some Disney Infinity 3.0 levels. 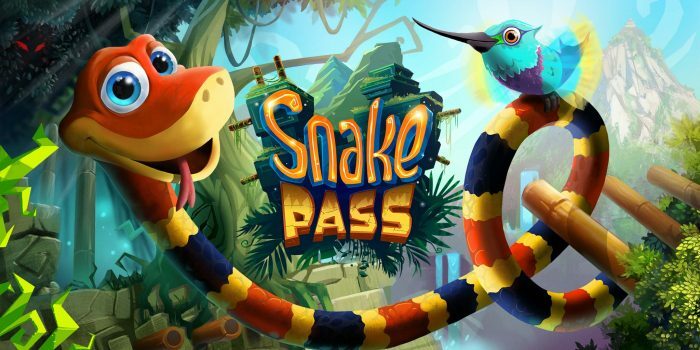 However they have finally decided to break out and come up with their own original IP, Snake Pass, that upon seeing it for the first time around a year ago instantly reminded me of something I would have experienced on the Nintendo 64 many years ago. 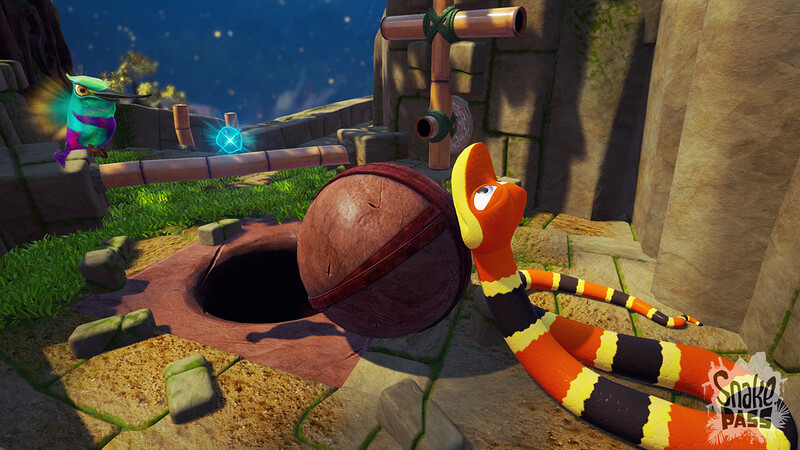 In Snake Pass you play as the adorable snake called Noodle. Yes I hate snakes in general but this is a game and Noodle is just too adorable to hate. You start the game with Noodle snoozing in the sun only to be awakened by his hummingbird friend Doodle. Doodle has woke you up to inform you that an evil presence is going to shut down gates throughout the world that allow travel between the various islands in the sky. It’s up you as Noodle to stop this and keep the peace of this world. The game is a platformer but since you play as a Snake it’s quite different from most other games in this genre. Physics play a much bigger part in this game as you have to learn how to wrap Noodle around things to climb up them to proceed in the levels. Basically you need to think like a snake would in how to traverse this world. The first level in the game is easy enough to get through as the game teaches you to move. The R2 button makes Noodle move and you move him in directions with the left analog stick. You’ll move way to slow just doing this so in order to pick up speed you need to slither back and forth by moving the left stick left to right just as a snake would. When you reach an object you need to climb the X button lifts Noodle’s head up allowing you to do so. Doodle can even help Noodle out by lifting his tail up with the Triangle button which you’ll need to do to make climbing some things easier. In one of the early levels I had to climb up a stack of bamboo to reach a coin placed way up on this rock. I struggled with getting up this for quite awhile because I chose to do this first before the game taught me the last action I could perform. You see if you press the L2 button down it allows Noodle to grip whatever surface he is on. Had I known this that bamboo stack would have been easier and I wouldn’t have fell so many times. Some players may struggle with this control scheme and there is a easier one you can use in the options but I really liked the default one once I got the hang of it. Younger players who maybe don’t have as much patience will likely prefer the easier control method. The game is split into around four different worlds with around 15 levels in total and to complete each one you’ll have to find things called keystones to open the end level gate. There is a red, yellow, and green keystone in each level to hunt down. Along with those each level also has five hidden coins as well as blue orb things scattered around for the completionists out there like myself. Some of these are very well hidden like way up on that rock I mentioned earlier as well as some that are hanging on a ledge on the end of a map. Whether hunting for the keystones or the coins you’ll have to solve some puzzles to reach them. This can involve figuring out how to wrap yourself around objects to climb them, pushing stone balls into holes, flipping levers and so on. The only problem I really had with the gameplay of Snake Pass is that the camera in the game didn’t always agree with me. In certain instances the camera can get too close to Noodle making it very hard for me to see what I was doing. I even ended up falling off the level to my death a couple times due to the camera zooming in too far while I was trying to do something. Having to adapt to the control scheme can be challenging enough without the camera further hindering what I wanted to do. So I mentioned there are four worlds in the game and all of them look great. The game runs on Unreal Engine 4 and each world is built around certain environmental themes such as water, lava, air, and grass. All of them look great especially the lava and water worlds. I played the game on PS4 Pro which offers two different visual settings. You can either play standard mode at 1080p/60FPS or turn on the 4K mode which actually runs around 1512p/30fps. I preferred the 60fps mode for a smoother experience but I appreciate the option. 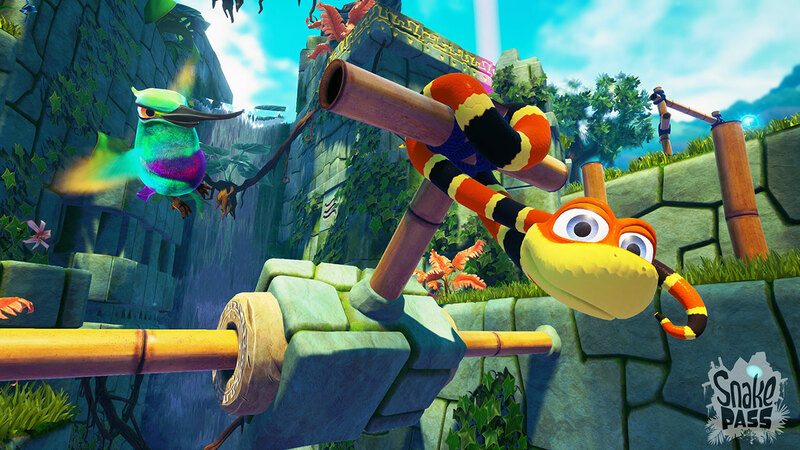 Another thing I really liked about Snake Pass is the animation of the characters. 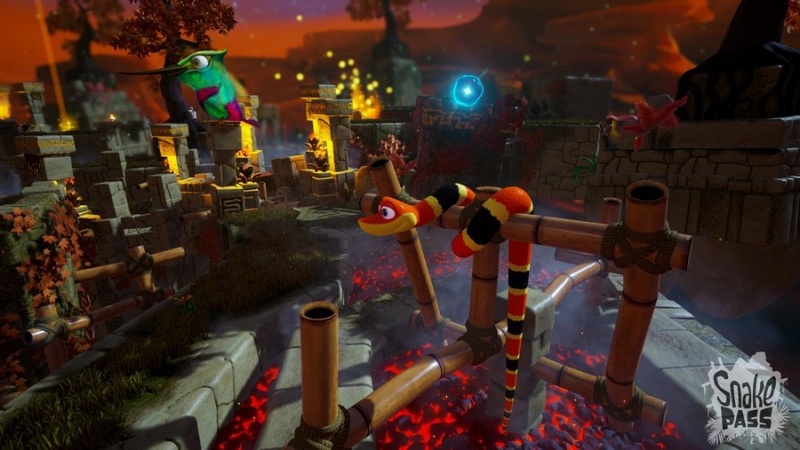 Sumo Digital brought something from LittleBigPlanet over to Snake Pass in that if you use the directional buttons you can make Noodle change his facial expressions. Doodle will also do things like fly right up to the screen and look at you if you go idle for a period of time. These things just further added to the charm that this game is full of. The soundtrack in the game is one of the things I was most excited about as it was done by David Wise who if you don’t know has done pretty much all of the Donkey Kong Country game soundtracks as well as the Yooka-Laylee soundtrack. He once again delivers a great audio experience in Snake Pass although much like the game I wanted more. Yes while the game has several different worlds it felt like it went by too fast. It took me around 8 hours and I plan to go back and play longer to get the Platinum trophy. There are also time trials for each level that will really challenge you and require you to have your head wrapped around the controls in order to succeed. 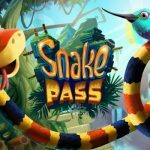 While I wish the game was longer for $20 Snake Pass is a no brainer and well worth the purchase. I’m pretty happy that in the first few months of 2017 we have seen a couple games, Snake Pass included, try to bring back that magic that so many late 90’s 3D platformers had. Snake Pass has such a charming main character like those games of old and fun and colorful worlds as well. 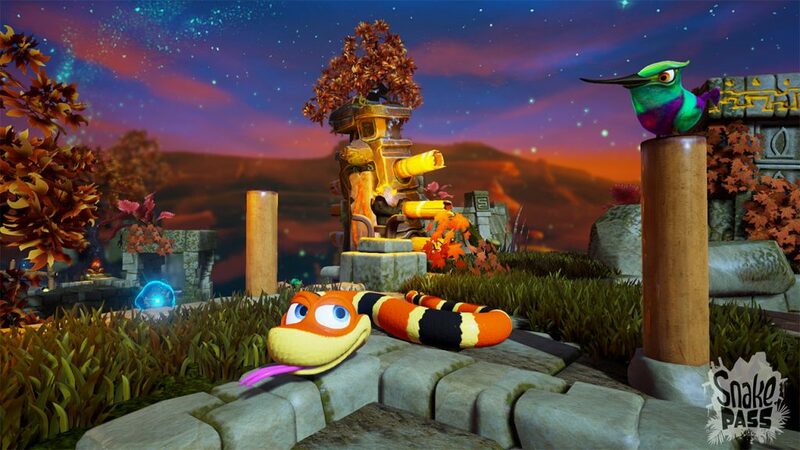 I never thought playing as a snake could be so much fun but Sumo Digital has proven that it can be. Yes I wish it was longer and the camera needs work but what Sumo Digital has put forth here is a strong foundation to build on and I hope I get to go on more journeys with Noodle and Doodle in the future.